–Oh Say Can You C!! The C’s Celebrated the Mt. Mesa Trios Tournament with Strikes!! Mt. Mesa Lanes/Gabby Mayfield hosted their first-ever Trios Tournament this past Sat., July 7. There were three qualifying squads and the event ended up with (24) teams competing. Quite a few bowlers from Bakersfield made the trip to Lake Isabella to support this event including many of the Central Valley Masters group, who also helped Gabby with the event. First C out of the gate with a 300 game was Carlie Medina III, followed by Bowler of the Year Charles Gabriel who shot a 299, then Craig Dowd joined in and also shot a 299. Congratulations for some great bowling for these three. The tournament used a house shot. “They took the top two teams from each of the three squads and then took the top two high alternates from all three squads who didn’t qualify,” said Ian Byers/CVM who kept the stats. A good time was had by all! When the strikes cleared, the champions were Lake Isabella’s Jordan Clements and Cameron Mason with Bakersfield’s Bobby Long. Congratulations to Deaken Kimbrell, Taylor Del Tiempo, Desmond Smith and Gabriella Hogan on qualifying for the Diddy Watts State Semifinals which will be held on Aug. 11 at Rancho Bowl in Santa Maria. 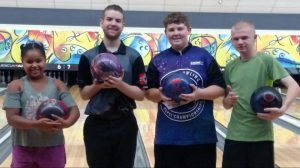 They qualified in the Diddy Watts Youth Qualifier the weekend of June 30-July 1 that was held at Linbrook Bowl in Anaheim. The Hall of Fame nomination boxes are out on the front counters of AMF Southwest Lanes, Mt. Mesa Lanes and AMF Westchester Lanes for league bowlers to be able to nominate their choices for bowlers to be considered for the honor of either Superior Performance or Meritorious Service. Please notice that qualifications for both honors are printed on the sides of the nomination boxes (green is for Superior Performance and yellow is for Meritorious Service). Nominations need to meet these qualifications in order to be considered. Then fill out a slip for whichever honor you want your nominee to be considered and drop it in the box. These boxes will remain out now until July 25th. All nominations slips will be reviewed by the GEUSBC Hall of Fame Committee to check if those nominated fit the qualifications and, if they do, those names will be added to the 2018 list of nominees. The Hall of Fame Committee will be meeting a couple more times this season to narrow the names down to recommend to the GEUSBC Board to be considered for induction for 2018. Those currently serving on the Hall of Fame Committee are Glenn Yeoman, Aris Anadilla, Mike Hefley, Bette Addington, Sonny Pollard, Lisa Isbell & Ian Byers. 2018 inductees will be honored at the 2018 GEUSBC Awards Banquet scheduled for Sat., Oct. 20th at the Eagles Hall downtown. Open to all Summer league bowlers and local league bowlers to give you a chance to try the latest EBI balls that will just be released to prepare for the upcoming Fall/Winter league season! Robb White/Robb’s Pro Shop will present the EBI Demo Day on Thurs., Aug. 2nd, from 3pm-6pm so mark your calendars now so you don’t miss this opportunity to be able to try the latest from Ebonite, Hammer, Track or Columbia line. Have you checked out the new Facebook page “Golden Empire USBC” yet? If not, you’ve missed a lot and need to like it! The first tournament put together by the newly-formed Golden Empire USBC Tournament Committee coming up is the Bakersfield Scratch Open which will take place on Sat., August 11/National Bowling Day at AMF Southwest Lanes. There are two qualifying squads—one at 9:30am and the other at 2pm. $1,000 is guaranteed for first place (based on 50 entries). Cost to enter is $80 for 6 games of qualifying. For further information on this event, go to the Golden Empire USBC Facebook. As many of you may or may not know, Directors and Board members of your local association are volunteers and do not get paid and do what they do for the love of the sport. This extends to those who work the Lane Certification Committee as well as those who are our Youth Coaches for the Saturday Junior league. They give up their Saturdays to come help coach those youths that want to improve their game and obviously their efforts don’t go unnoticed. Golden Empire USBC should be proud to know we had two youths win their 2018 State BVL divisions as well as we just had four youths advance to the State Diddy Watts semifinals! 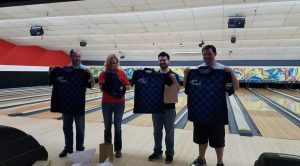 Bowling coaches Phil Chow, Brian Maurseth, Randall Carter and Lisa Isbell were presented their bowling shirts at the end of the season a couple weeks back at AMF Southwest Lanes. Another established bowling center located in Fremont is in trouble of being torn down for redevelopment for housing units. The Cloverleaf Family Bowl, which has been in existence now for 55 years could be demolished. David & Marian Hillman opened Cloverleaf Bowl on March 23, 1963, and the center has stayed in the family and is now ran by Mike Hillman. Over the 4th of July holiday, in a local parade, an entry in the parade was done by a group of bowlers who wanted to bring attention to this issue and was well received! Please go online and sign the petition now to save Cloverleaf Family Bowl. The link address is https://www.change.org/p/save-cloverleaf-family-bowl. –Golden Empire USBC Lane Certification Committee Needs Help! If you have time to help our GEUSBC Lane Certification Committee they are looking for some local bowlers to become a part of this committee and to help them when they go certify lanes. This is the time of year that this process starts. The committee usually goes out in the morning, or when the center first opens, to perform this task. It takes several hours (depending how many lanes the center has). The committee is currently looking for 4-5 people to help them this season. If you are interested or would like more information on what is involved, please contact GEUSBC President Ray Neubig at 661/333-8969 or talk to Diz Francisco. Mon., May 21st thru Mon., Sept. 3rd: Sign up NOW for “Summer Games” Season Pass. Bowl (3) games every day, all summer for (1) low price. Sign up NOW at bowlsummergames.com. Children (15 & Under) Standard Pass is $9.95; Passport is $43.95. For Adults (16 & Over) Standard Pass is $15.95; Passport is $48.95. Pays for itself in (3) visits or less! Mon.-Fri., open at 8pm; Sat. & Sun., open at 4pm. – Congratulations to Jack Dunn on his 4th career 300 game that he rolled for his second game of the night on Wed., June 27th bowling in the Gamblers Anonymous league at AMF Southwest Lanes. – Congratulations to Andrew Svoren who came out blasting strikes and added another 300 game for his first game of the night to his career of many on Thurs., June 28th bowling in Robb’s Ball league at AMF Southwest Lanes. 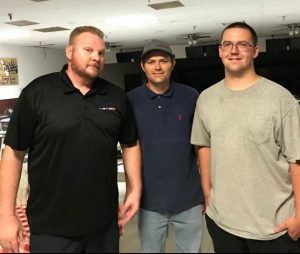 Teammates Jesse DeLaHerran rolled a 245 and Kevin Harris, a 246, so his team–“3 Guys/6 Balls”—bowled a whopping 791 scratch team game that game which took over the league’s season top scratch game! Handicap Singles: 1. Zack “The Real” Long (934); Alex “10lb ball” Garcia (881); Lynn “The Pin” Bender (859). SPECIAL NOTICE: Next Sunday, Jul. 15, Coffee Club will be doing a 9-Pin No Tap Coffee Club! Handicap Doubles: 1. Lynn “The Pin” Bender & Doc Victor (1699); 2. Angel Purcell & Pudge Miller (1689). Handicap Singles: 1. Alex Garcia (890); 2. Lynn Bender (866); 3. Pudge Miller (859). 3-6-9 was hit today by Alex Garcia for $360! Alex said he always has to thank his helpers, Norris and “LA”Donna! *Coffee Club is on Sunday mornings starting at 11am at AMF Westchester Lanes. Cost to enter is $20 for 4 games, blind doubles draw. Optional high pots, singles, and 3-6-9. Handicapped and fun bowling with some great local bowlers! !